The Serious Sweet Company, based in Harrogate, has been taking inspiration from Willy Wonka when it comes to its new seasonal Hot Cross Bun Fudge which has been created exclusively for Asda’s Extra Special range. Asda is stocking this fun new fudge as the supermarket co-developed the flavour with the help and expertise of the sweet maker as part of an ongoing partnership that sees lots of exciting flavours developed for both seasonal occasions and all year-round sale. The multi award winning Serious Sweets Company has been making candy confectionery for the last five years out of its Harrogate home and specialises in ‘making the best fudge on the planet’, which is no mean feat. 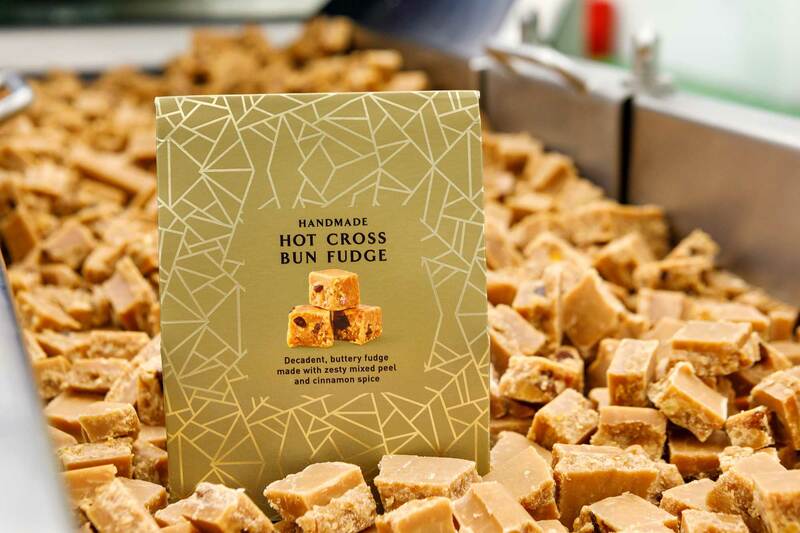 In addition to the wonderful array of fudge flavours, they also create toffee, honeycomb, butterscotch, nut brittles and coconut ice, keeping true to traditional favourites that customers know and love. More recently, they’ve expanded into the world of gourmet marshmallows to keep ahead of the lighter sweet trend that modern confectionery consumers are looking for. The company, that started out selling into local farmers markets, deli’s and independent retailers, swiftly became a confectionery force to be reckoned with, turning over £5m annually, employing 35 colleagues and selling to the UKs largest supermarkets, including to Asda which is headquartered close by in Leeds. We are delighted to be working with Asda as part of a long-term partnership that sees us develop the most fantastic and flavoursome fudge flavours, along with countless other confectionery, including our newest creation – the gourmet mallows. We spent six months from development stage to launch getting the hot cross bun fudge to the high standard we hold ourselves to. The inspiration came from looking at classic Easter flavours found in many other categories and combining them with something new – I mean why not hot cross bun fudge? Asda seeks quality and creativity within its Extra Special Range and we recognised these qualities in abundance within our own portfolio. Customers love artisan confectionery and are being quite experimental when it comes to flavours across all areas of the food and drink sphere, and we’re seeing this come across in our product portfolio. The team at the Serious Sweet Company are the perfect partner for us when it comes to capturing the taste of the nation in sweet form and we know our customers will love the familiar flavour of hot cross buns. They use a traditional method using copper pans and letting the fudge cool slowly to give it the perfect crumbly, melt in the mouth texture. We’ve added mixed peel, plump fruit and spices to the classic fudge base recipe to give hot cross bun goodness! There’s a sense of pride when something is created locally, and customers who are local to Harrogate want to support the success of homegrown businesses on their doorstep. This new Extra Special fudge is of premium quality and because of how unusual it is, we’re hoping it will make a great gift item – for Easter or for yourself.